Fairness involves fairness to the providers of help and fairness to those in need of help. A sense of ‘fairness’ is often suggested when people are asked to name a leading quality of the British people. 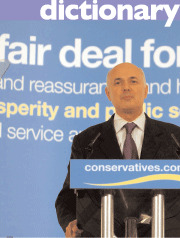 When the Tories (unfortunately fleetingly) chose ’a fair deal for everyone’ as their organising slogan (in 2003) they were quickly followed by copycat New Labour. Tony Blair promised ’A future fair for all’. For Labour fairness is mainly about helping the underdog. Compassionate conservatives also support special help for society’s most vulnerable people but they understand another side to fairness. For conservatives fairness is less doctrinaire than socialist ideas of equality but still much kinder than libertarian ideas of laissez-faire. Recognising the wisdom of Boetcker’s ‘Ten Cannots’ conservatives reject socialist conceptions of equality because they know that the necessary advance of social justice depends upon fair reward for the vigorously virtuous. Some people will focus on raising a family, others on the pursuit of wealth, others on travel, sport or the arts. A fair society will give every person reasonable opportunity to pursue their own paths to peace and happiness. A fair society will also give people a safety-net and second chances when things go wrong. But a fair society will not attempt to create an absolute equality of outcome when aspirations, efforts and good fortune are not distributed equally in the first place.